ÎÍµ¨Ñ´!! »ÅÑ´äÁèµéÍ§ºÍ¡ à¾ÃÒÐ¼Ùé¨Ñ´ã¨´Õ RegiStar (ÃÕ¨ÔÊµÒÃì) ÃÕºÁÒºÍ¡¢èÒÇ´èÇ¹ªÇ¹¿Ô¹ãËé MAY ªÒÇä·Â (àÁÂì : ª×èÍ¡ÅØèÁá¿¹¤ÅÑº PARK JIHOON ÍÂèÒ§à»ç¹·Ò§¡ÒÃ) á¿¹¤ÅÑºË¹ØèÁË¹éÒËÇÒ¹ PARK JIHOON (¾Ñ¤¨ÕÎØ¹) àµÃÕÂÁµÑÇãËé¾ÃéÍÁ ¡Ñº§Ò¹á¿¹ÁÕµµÔé§à´ÕèÂÇ¤ÃÑé§áÃ¡ã¹»ÃÐà·Èä·Â “PARK JIHOON 2019 Asia Fan Meeting in Bangkok [First Edition]” ÇÑ¹àÊÒÃì·Õè 9 ÁÕ¹Ò¤Á¹Õé ³ ¸Ñ¹à´ÍÃìâ´Á àÁ×Í§·Í§¸Ò¹Õ ä´éà¨Í¡Ñ¹!! ªéÒ¡ÇèÒ¹ÕéäÁèä´é!! RegiStar (ÃÕ¨ÔÊµÒÃì) ¤ÇéÒµÑÇË¹ØèÁÇÔé§¤ìà¨éÒàÊ¹èËì ¾Ñ¤¨ÕÎØ¹ ÁÒ¾º MAY ªÒÇä·Âã¹§Ò¹á¿¹ÁÕµµÔé§à´ÕèÂÇ¤ÃÑé§áÃ¡ã¹»ÃÐà·Èä·Â “PARK JIHOON 2019 Asia Fan Meeting in Bangkok [First Edition]” ·Õè¡ÒÃÑ¹µÕ¤ÇÒÁ¿Ô¹à¾×èÍá¿¹æ ·Ø¡¤¹ àµÃÕÂÁËÑÇã¨¤Ø³äÇéãËé´Õ 9 ÁÕ¹Ò¤Á¹Õé ä´éËÅ§àÊ¹èËìÇÔé§¤ìÅÐÅÒÂã¨¢Í§Ë¹ØèÁ¨ÕÎØ¹¾ÃéÍÁ¡Ñ¹ÍÂèÒ§á¹è¹Í¹!! 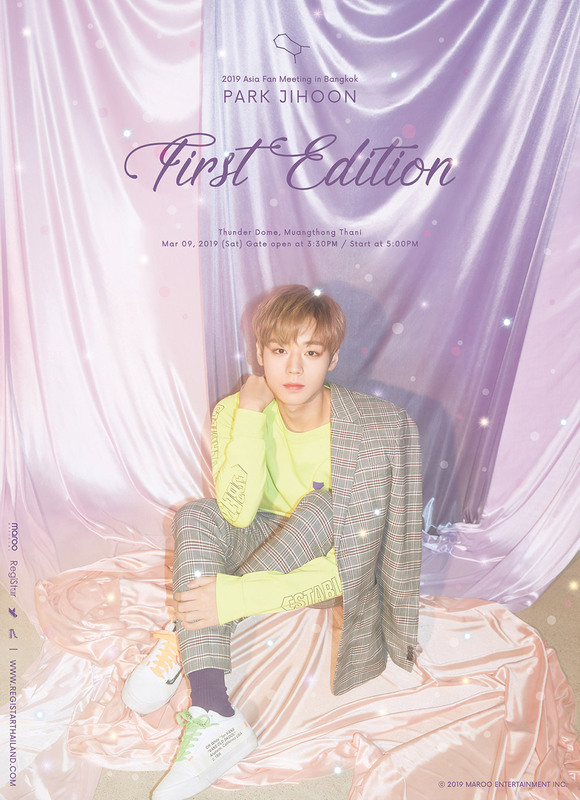 Park Jihoon - The 1st SOLO Asia Fan Meeting in Thailand on this March 09!! Hottest news from RegiStar!!! For Thai MAY (PARK JIHOON’s official fan club name) and anyone who is waiting for sweet & charming guy, PARK JIHOON, no need to wait for longer time. 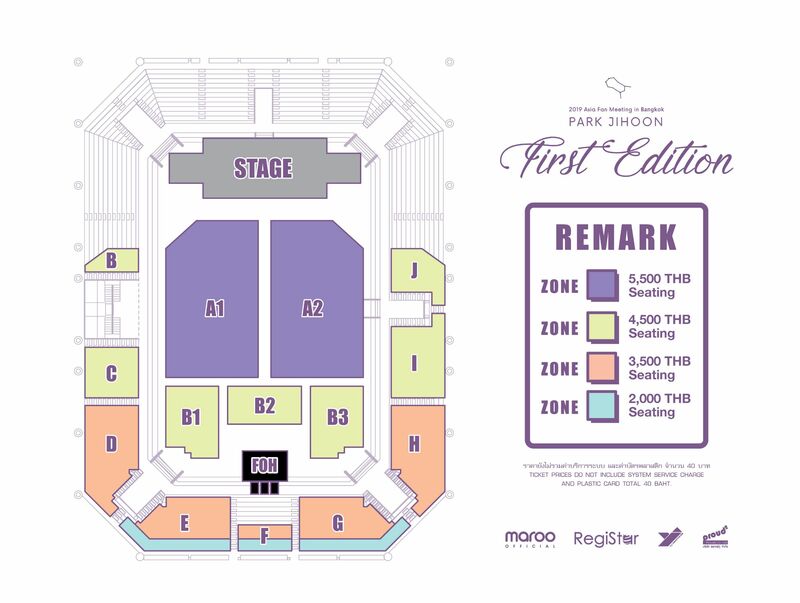 Get ready for “PARK JIHOON 2019 Asia Fan Meeting in Bangkok [First Edition]” to be held at Thunder Dome, MuangThong Thani on Saturday - March 9, 2019.